No Damage to the condo from Hurricane Florence. Monthly rentals are available. Happy to help with last minute reservations. Ocean Keyes has 6 swimming pools and 6 HotTubs...!!! Ocean Keyes now has a HEATED SWIMMING POOL.....!!!! Winter Rates for December thru March based on 3 month rental. Our condos in Ocean Keyes are a short walk to the beach, Fat Harold's, Ducks, The Spanish Galleon, Pirate's Cove, as well as, all the restaurants, and shops located along Main Street and Ocean Drive..
We also provide high speed wifi along with expanded cable with high definition cable boxes in the living Room and both bedrooms YEAR ROUND. Expanded cable includes: HD Channels, Primetime on Demand, and SHOWTIME. Be Sure and Ask About Availability of Our Golf Cart. Looking for a vacation getaway with all the upgrades? Look no further. Our first floor Condominium is located in the gated community of Ocean Keyes which is only two blocks from the Atlantic Ocean and a short walk to Shagger's Paradise on Ocean Drive. Located in Building #31, you back to a pool complete with hot tub, kiddie pool, and the fitness center. It is a short walk to the beach, or you may drive and take advantage of FREE public beach parking located all along Ocean Drive which is easily accessed through the back gated entrance to Ocean Keyes located on Hillside Drive. The living room features a queen sleeper sofa, a Plasma TV and a Blu-ray DVD player. There is a washer and dryer in the Condominium as well as an iron and ironing board. The kitchen features granite counter tops and is fully equipped with a smooth-top range/oven, refrigerator with ice maker, microwave, coffeemaker, blender, toaster, pot and pans, plates, glasses, utensils, etc. The master suite comes with a king bed, an HD TV with DVD/VCR, a large walk-in closet, a ceiling fan & luxurious bath with tile flooring & a six foot tub/shower. The 2nd bedroom features a queen bed, TV with DVD player, and a full bath with tile flooring. Ocean Keyes features 6 swimming pools, 4 kiddie pools, 6 hot tubs, a fitness center, and a recreation room with an LCD TV, card tables, and a pool table. There are also 2 tennis courts. There are barbeque areas with gas grills, picnic tables, walking paths throughout the community, and a large lake. The Myrtle Beach area features nearly 100 golf courses, restaurants, miniature golf courses, theaters, as well as some of the best shopping on the east coast including Barefoot Landing, Tanger Outlets, Colonial Mall, Broadway at the Beach, and the Coastal Grand Mall. Some of the most popular attractions include The Alabama Theater, Dixie Stampede, Carolina Opry, The House of Blues, The Palace Theatre at Broadway at the Beach, Ripley's Aquarium, I-Max Theater, Celebrity Square, Hard Rock Cafe, and numerous Night Clubs. We have 2 children and our condo is very 'kid' friendly". The ground floor condo backs to one of the 6 pools and the fitness center and building #31 is adjacent to the tennis courts. You can even access the pool from the screened patio. The condo is clean and ready to use. You won't find a nicer condo in Ocean Keyes...!!! 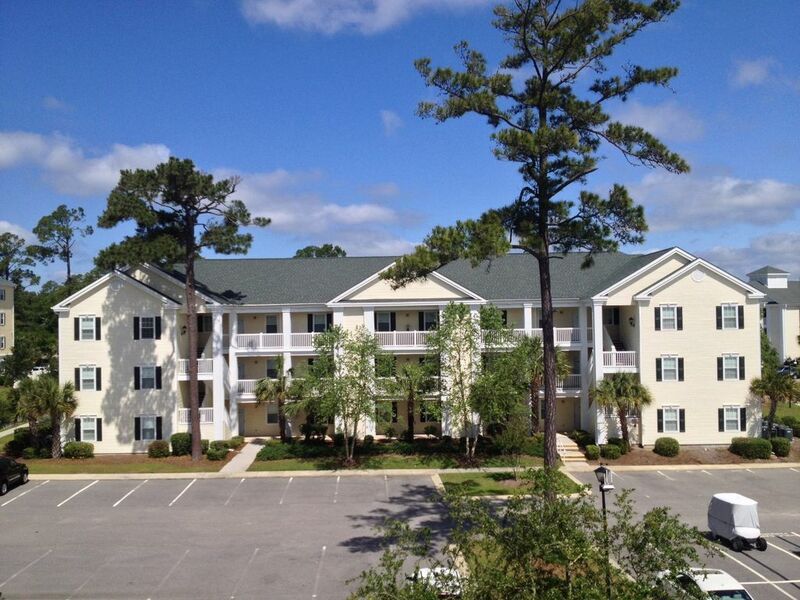 Ocean Keyes is by far, the best location in North Myrtle Beach. A short walk to the beach, Main Street, shopping, restaurants, ect. Super Wal-Mart, Kroger, and Bi-Lo Grocery is only a 1 minute car ride away. The new North Myrtle Beach Town Center which has a Publix Grocery Store is around 3 miles from the condo. Very convenient location... Enjoy Plenty of FREE Parking in N. Myrtle Beach. Prime location just a short walk or golf cart ride to the beach. Tile Flooring in Both Baths. Ocean Keyes is a gated community. The back gate is only 1 block to the beach.. Short 4 to 5 minute walk. There is also FREE parking about every block if you want to drive your car or our golf cart. Hi-Speed internet is excellent. Much better than what is offered in hotels or high-rises along the beach. FREE Wireless Internet is Available YEAR ROUND in the condo. Saran Wrap, aluminum foil, sandwich baggies, trash bags, a roll of paper towels, toilet tissue, hand soap, laundry detergent, dish detergent, & dishwasher detergent are provided. Dining table with extra leaf and seating for 8. Plasma HD TV in the Living Room, HD TV in the Master Bedroom and a 26" TV is in the Guest Bedroom. Expanded Cable TV is also provided on all 3 TVs. There is a pool table in the Recreation Room. Large parking lot offers ample parking. 2 Gated entrances provide restricted access to Ocean Keyes * Short walk to the beach. There is also plenty of FREE Parking at the Beach if you would rather drive. Feel free to ask if our golf cart is available for your dates.. Enjoyed our stay! Scott was great to work with. Clean and convenient to heated pool/hot tub. Would definitely stay again! Very good. Has everything you need especially if you have children. Very clean. You only need food and towels. Did have gnats flying around but it's that season. Scott was very easy to work with and patient. Loved the unit. Had everything stocked we needed and lovely location. Convenient to everything. My family and I were lucky enough to stay in this unit a few weeks ago. It was perfect. I especially loved the fact that we didn't have to worry about packing beach chairs, boogey boards and umbrellas. It was clean, very comfortable and close to everything. The first floor is a MUST for the kids. It was a lovely week. Thank you for sharing your beach home with us. Scott was very friendly and helpful with our stay. The condo was very clean and had all the amenities of home and more! It was a treat to have the golf cart to use to take the family to the beach and back. The pool and work out facilities were very nice and the complex was quiet and family friendly. We truly enjoyed our stay and hope to return again in the near future. The Myrtle Beach area features over 100 golf courses, restaurants, miniature golf courses, theaters, as well as some of the best shopping on the east coast including Barefoot Landing, 2 Tanger Outlet Locations, Colonial Mall, Broadway at the Beach, and the Coastal Grand Mall. Some of the most popular attractions include Barefoot Landing, Tanger Outlets, The Alabama Theater, Pirate's Voyage, Carolina Opry, The House of Blues, The Palace Theatre at Broadway at the Beach, Ripley's Aquarium, I-Max Theater, Celebrity Square, Hard Rock Cafe, Dave & Busters, Planet, Various Night Clubs, and more.